If the race photos from the Kaiser Permanente Half Marathon are any indication, the race sucked for me. The photos are so awful and grimace-filled that the only one I can post without serious embarrassment is this posed one from the finish line. This is a fake smile. The race was bad for me: my legs felt heavy from the start, and maintaining what should have been a comfortable half marathon pace (8:30 – 8:45) was burdensome and unreasonably difficult. Right before we hit Ocean Beach, I fell apart, suffering from the same knee pain that occurred during North Face and has reared its ugly head during my runs since the 50K. My pace slowed way down (to a 10:14 mile at mile 11), and I painfully shuffled through the out and back along the beach and to the finish line. I finished feeling defeated and in pain; my knee along the outside of my leg was killing me. You can see where it gets ugly. I visited an orthopedist yesterday and was relieved when she confirmed my suspicions: my hips are weak, resulting in a tight IT band. She pulled and twisted my legs and knees in multiple directions to rule out a torn meniscus, and I’m very thankful that nothing is seriously wrong. I had arthroscopic knee surgery in 2005 to fix a torn meniscus and have not suffered from knee pain since the procedure. My doctor said I could continue running but to stop if I start feeling pain, so I’ll be testing this out with a short run this weekend (if it’s not raining). I know many runners suffer from weak hips and glutes, but I thought I could avoid the same fate through my weekly BodyPump, yoga classes, and strength training on my own. To combat this weakness, I’ll be incorporating hip-specific strengthening moves into my workouts at least a few times a week. I want to run Way Too Cool next month, so I’m hoping my IT band improves by March 7. What a bummer! I know that can be so frustrating. I hope that your exercises help out and that you are ready for the next race. I have photos like what you described (from the same kind of discomfort/injury). They’re actually hilarious to me.. I was running a 10-mile race in Syracuse, NY and developed a pretty bad case of hip bursitis during the race.. 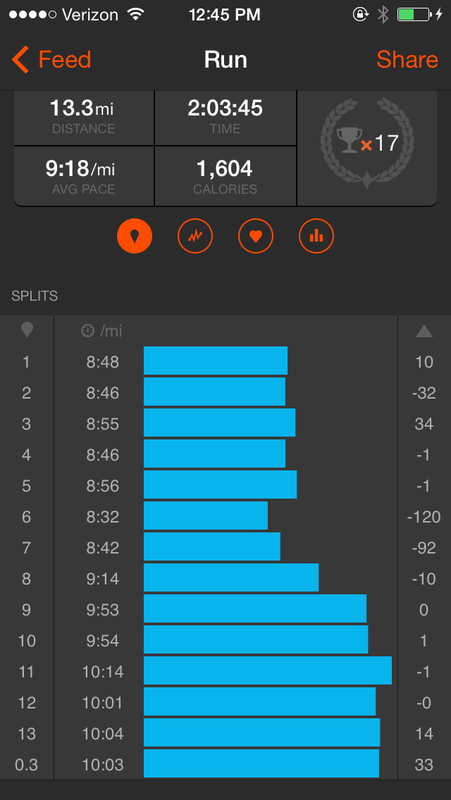 I kept telling myself to hang in there – a 10k is not that far! “YOU CAN DO IT!” and so, to my demise, when I got to the 6 mile mark and realized I was nowhere near the finish, because I was running a 10 MILE race, not a 10 kilometer race, I was devastated. The photos told a story of an elderly woman on her way to a hip replacement surgery. 🙂 I’d actually like to see at least one horrid photo of yours. And, I can see by your splits that you were hurting, and I like that your post came around to strengthening hips! Most of my strength routine revolves around hips/hip flexors/glutes.. lots of power movements since I’m also a cyclist. Keep up the good work and hope your hips are stronger the next time around! Rest up! Great post. haha, thank you! I will post a bad photo when the burn has worn off a bit…OMG I can’t believe you thought you were running a 10K and hobbled to the end like that! Smart for you to focus your strength routine on your hips. Sitting all day and running is sure to weaken them! So sorry about your pain issues 😦 I hope you are able to work through this and get back into prime shape for your next race….what is Way Too Cool, btw? If it makes you feel any better, my race photos look disgusting even when I have the best race of my life. I’m trying to come to terms with the fact that I am simply not photogenic. 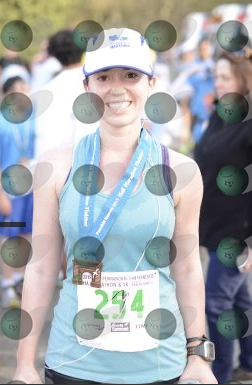 People who look like a million bucks in race photos are the bane of my existence. Thanks Hanna! I hope a little physical therapy helps. Way Too Cool is a super popular (in California) 50K that takes place on part of the Western States trail. It’s supposed to be incredible. I can’t hate him, he just looks so happy and innocent! That stinks your race didn’t go the way you wanted to, but way to finish up! Glad you figure it out and that it’s nothing major! Hugs! There are so many people with Hip/Knee problems! I’m amazed that I am only injured with my hamstring but after both pregnancies I had weak hips/hip flexors/lower back etc. So important to strengthen your body! ITBS is the worst. Not sure if the ortho told you this, but avoid foam rolling on the IT band itself. It can actually make it worse, contrary to what most people believe. Try rolling the glute and the TFL muscles (front/outside of hip and upper quad) instead. They both attach to the IT band and pull on it when they get tight. Hope this brings a little relief!! Thanks Angela! She didn’t tell me that but now that you mention it, I think I’ve read that before in RW. Thanks for the advice; I’ll roll the attachments to the ITB. So sorry to hear you had such a rough race! Your picture looks exactly like my Surf City pics do, sorry! Hopefully the new exercises will help, good luck with your run this week! Sorry to hear about your pain! I hope that your exercises help. I do some of the ones you show in the pictures and doing them regularly (and I mean a couple of times a week forever!) will build up your muscle strength for sure. Thanks for the reassurance! I’m hoping they help. So sorry to hear about your knee issues. In addition to the strength exercises, have you done any ART (active release therapy)? I swear by my ART guy for so many things and attribute being mostly injury-free to him. Thanks Kristina! I haven’t been to an ART person yet, but that’s a really good idea. Thanks for the idea! I have one and use it for abt half the day. It helps. NO fun!!! 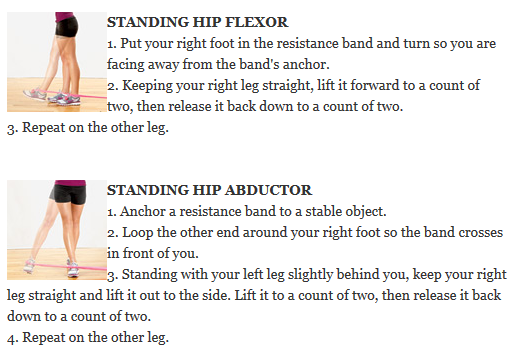 Once you start doing those exercises regularly I bet your ITB feels better!! I do a bunch of those exercises daily! 🙂 It is not so bad once you get in the habit!!! Rest and recover well!